Today's Dow Leader is a financial stock. The Dow Jones Industrial Average (DJINDICES:^DJI) is up following some mixed reports on the economy. As of 1:20 p.m. EDT the Dow is up 55 points, or 0.36%, to 15,270. The S&P 500 (SNPINDEX:^GSPC) is up 0.46% to 1,658. The key reports are the PPI and the husing-market index. Industrial production and capacity are both down but in line with seasonal expectations. The producer price index fell a seasonally adjusted 0.7%, in line with expectations, led by declines in food and energy prices. Core PPI -- that is, PPI excluding food and energy -- was up 0.1% for April, below analyst expectations of 0.2%. Year over year, the producer price index is up 0.6%, down from the high of 2.3% it hit in September, showing that there's declining inflation among producers. Currently the bond market expects inflation of roughly 2% over the next five years. We will get more information on inflation tomorrow with the consumer price index, which is expected to be down 0.3%, while the core CPI is expected to be up 0.2%. The Federal Reserve is keeping an eye on inflation and inflation expectations as it continues its quantitative-easing program. The National Association of Home Builders' housing-market index rose to 44 in May, beating both April's lever and analyst expectations. Homebuilder confidence rose significantly last year but is still below 50, which indicates that more builders see conditions as negative, rather than positive. You have to go back to 2006 for the last time the index was above 50. 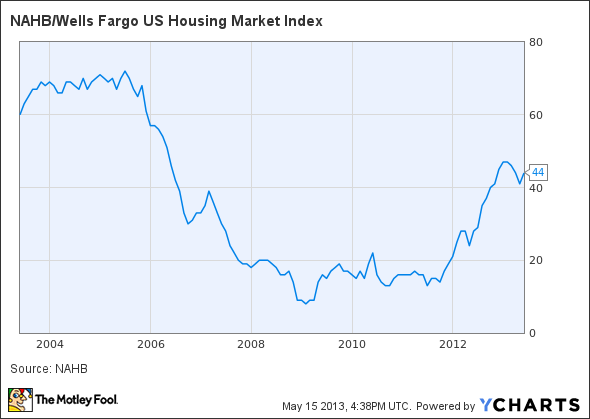 NAHB/Wells Fargo US Housing Market Index data by YCharts. Builders are noting an increased sense of urgency among potential buyers as a result of thinning inventories of homes for sale, continuing affordable mortgage rates and strengthening local economies. While industry supply chains will take time to reestablish themselves following recession-related cutbacks, builders' views of current sales conditions have improved and expectations for the future remain quite strong as consumers head back to the market in force. Given the low inflation and positive news on the housing market, financials and consumer goods stocks are leading the way today. Today's Dow leader is JPMorganChase (NYSE:JPM), up 1.8%. Bank stocks have been rising with the market, the Dow, JPMorgan, and Bank of America are all up 16% this year. Yesterday, hedge fund manager David Tepper was on CNBC with some bullish comments on the economy and bank stocks in particular. JPMorgan has been in the news a lot lately over its "London Whale" scandal and concerns that shareholders will approve the splitting of the chairman and CEO roles. While it is good corporate governance to separate the roles, investors are worried that if the nonbinding vote is passed at the annual meeting on May 21, CEO Jamie Dimon will leave the company. Jamie Dimon is one of the best bank CEOs out there, and his departure would be a major blow to the bank. Many analysts are rallying behind the CEO, so it will be interesting to see whether this one passes or not.